The Tyrrhenian Admiralty had scrapped the part built liner conversion as part of the reparation deal. But the Admiralty still wanted to have aircraft carriers after what had happened to their forces during World War 2. The Royal Navy had almost twenty light fleet carriers either completed or in final fitting out at the end of WW2. The six Colossus class were all completed for the UK between 1950-58. With the Colossus class completing the Royal Navy was to divest itself of six of the older Majestic Class. 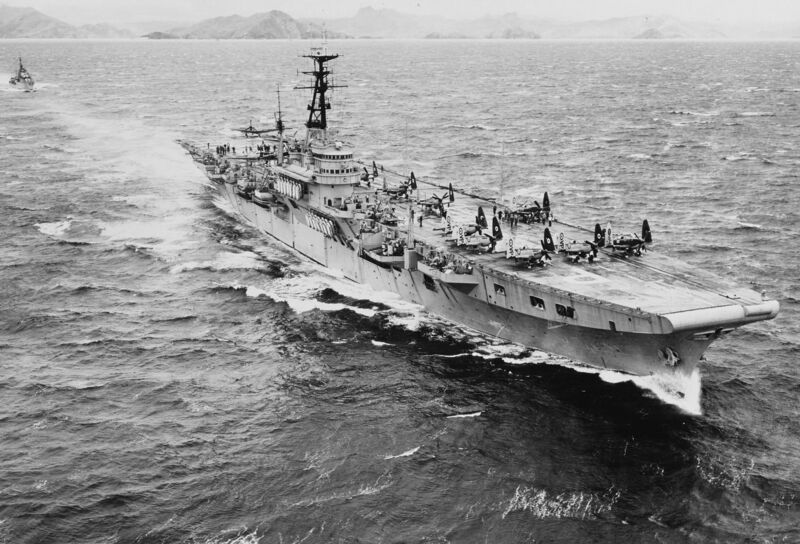 Tyrrhenia put its name down for two of the Majestic class carriers receiving the first in 1950 and the second in 1952. The names allocated to those ships followed the normal convention of keeping the islands of Tyrrhenia involved by naming new Capital Ships after them. The previous Cyprus had gone to France and the Sardinia had been sunk during WW2. HMS Triumph arrived in Tyrrhenian waters in 1950 and went through its acceptance trials. the ship being christened into the Tyrrhenian navy as Tyrrhenian Navy Ship Cyprus. Both ships arrived in their original Royal Navy states and any alterations to be done to the ships would have to be carried out by the Tyrrhenian dockyards. As all the new improvements came along the Tyrrhenian Navy received plans for the upgrading of their ships (angled flight deck etc) or had to purchase the technology from either Britain or the United States (mirror landing sights etc). The Cyprus having been first into service got the updates first, but it also meant that the Sardinia got the updates after they had been proved. The Cyprus had two squadrons of Seafires and two squadrons of Fireflies when it started its Tyrrhenian service. After two months there were only six Seafires left, the rest had been lost in landing accidents. Those six Seafires were landed and became part of the Air Force. 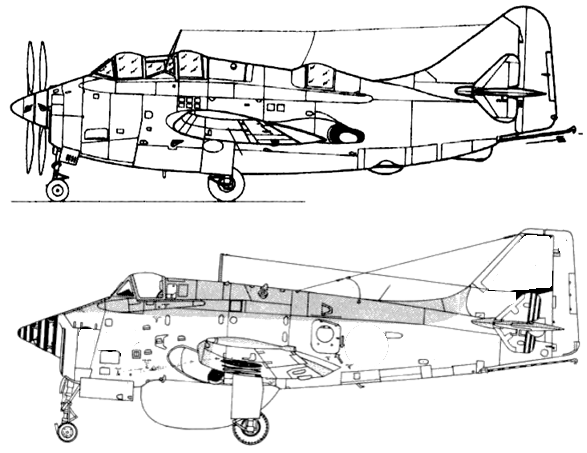 The Cyprus operated with the two squadrons of Fireflies till it received new Sea Vampire aircraft. 1952 and the new TNS Sardinia sailed into Syracuse harbour to rapturous applause as besides the ship, it was filled with aircraft. Five squadrons of Vampires and another two squadrons of Fireflies had been squeezed aboard, both in the hangar and on the flight deck as deck park. One squadron of Vampires went to the Air Force while the other four squadrons were for the carriers. The two ships were only able to operate 34-36 aircraft at a time. Each carrier had two full squadrons and two half squadrons each of Vampires and Fireflies. The rest were kept at the Syracuse Naval Air base and were used for protection of the base, but mainly as trainers and replacement aircraft for the carriers. The Vampires were upgraded to Venoms from 1960 and the Gannet was added to provide an ASW force for the first time. This was to be aided by the addition of helicopters from the mid 1960's. The final upgrades for the aircraft was the introduction of the Skyhawk fighter bombers from the early 1970's along with the Tracker series of aircraft. Thought was given to giving the ships ski jumps to operate Sea Harriers, but the cost was to prohibitive for such old ships. When the ships were removed from service, their air complements were transferred to the air force. Both ships received their angled decks, Cyprus 1958-60 then Sardinia 1960-61. The angled deck improved the types of aircraft that could be carried, but reduced the amount that could be carried. The two ships operated with the combined Mediterranean fleet which included the Italian carriers and American Sixth Fleet keeping the Russian Navy under surveillance. Armament After angled flight deck fitting. two of the twin 40mm were replaced with Sea Cat units. Guns: 4 × 20 mm (0.79 in) Hispano Mk.V cannon with 600 rounds total (150 rounds per gun). HMS Triumph in the Med, on its way to become the TNS Cyprus. Note Seafires and Fireflies on deck.